As part of the annual Central European University summer school, a series of five public film screenings will be held in late June and early July, one of which is taking place at OSA. At each screening, the film's director or producer will be present to discuss the work and take questions. The screening taking place at OSA on June, 28 is of Koji Masutani's 2008 documentary film Virtual JFK, which investigates one of the most debated "what if" scenarios in US foreign policy history: what would President John F. Kennedy have done in Vietnam had he not been assassinated in 1963, and then re-elected in 1964? 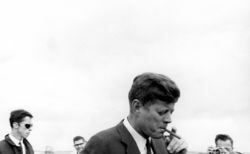 The film makes use of an array of resources including recently declassified archival footage, documents, and audio tapes, and testimonies from former Kennedy and Johnson administration officials. The guest of the evening is Peter Almond, the film's producer.